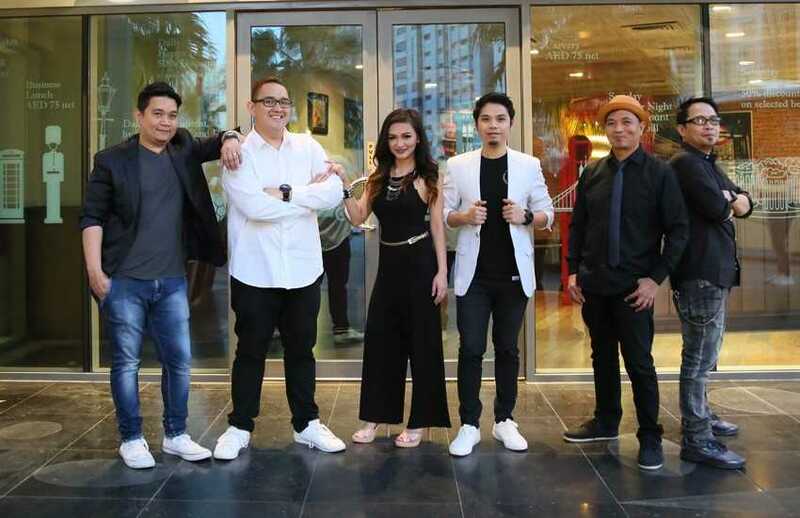 Porters, the classic English pub at the Grand Millennium, Al Wahda have announced their new house band ‘YFY’. The quirkily named band is pronounced ‘wifi’ (if you didn’t get it the first time), and we sat down with their lead singer Mikha Laqui, and multi-instrumentalist Dodie Cada to find out more about them and their live performances. How did you all get together as a band? (Mikha) Well, I joined back in 2014 for our first gig in Abu Dhabi. It was my dream to be in this band ever since I’ve watched them. Luckily, I grabbed the chance when the situation called for it! The band was formed way back 2008 with 5 all-male members. You can check out a photo album called “YfY: Then and Now” on our Facebook to see the band’s history. All the stories are there. What is it that you like best about being a lead singer? (Mikha) Sounds cliché but I’m doing what I love. It is the best for me, every night. Getting to do it with the people you click with is a rarefied thing. Plus getting to play at Porters gives me the chance to meet new people every night. If you weren’t a singer what would you want to be? (Mikha) I would’ve studied to become a lawyer, or maybe a politician. I would love to be the President but that’s a long stretch. Right now, I’m focused on the music. Describe your musical style. Does it fit a specific genre? (Mikha) I think my previous self lived in the Motown era because I have influences of old-school soul and rhythm and blues, even up to 90’s R&B. My mother and father are also musicians, so I guess their influences have rubbed off on me. Has your music evolved since you first began playing music together? (Mikha) Yes! This is something that I am proud of since YFY have been here in Abu Dhabi. We first played in Filipino Clubs and now we’re playing at Porters! Ever since, the songs we are playing have evolved to cater to the tastes of our guests. Dodie, you can play several different instruments, what was the first instrument you could play, and when did you think you could forge a career out of playing? (Dodie) It was the saxophone. Back in college, I became a scholar because of it. When I got hired to play in a band, I was 19 or 20. We had our first contract overseas. I earned US Dollars, and that was that! You play a selection of modern popular music, what songs never fail to get the Abu Dhabi crowd moving? (Dodie) For the more poppy stuff it really varies. Right now, it’s either “Shape of You,” “New Rules,” or “Rockabye.” Playing the classics though are easy, “Hotel California” by the Eagles is a surefire hit with the crowd. I could name some more but, yeah, that song definitely is a crowd starter. (Dodie) Stevie Ray Vaughan in my downtime. He is my go-to guy for my guitar influences. Eric Marienthal for saxophone and Jazz pleasures. What nights can we find you at Porters? (Dodie) We are playing Sundays through Fridays from 9 pm in the evening until 2 am. Come and check us out if you haven’t already seen us perform. Check out our Facebook at http://www.facebook.com/yfymusic and follow us @yfymusic on Instagram. Please do use the hashtags #yfymusic and #realgoodmusic if you’ll ever post about us! Porters, the classic English pub serves up unpretentious authentic pub grub, and one of the widest selections of beers in town. With Daily Happy Hour from 12 pm – 12 am daily on selected beverages, and Friday Brunch, serving up the best of British classics between 12 pm – 4 pm.